Hi this might (hopefully) be an easy one and something simple is being missed. I have a performance rule, which has a .vbs script in it, runs a SQL query and returns (a row count) into the property bag variable. 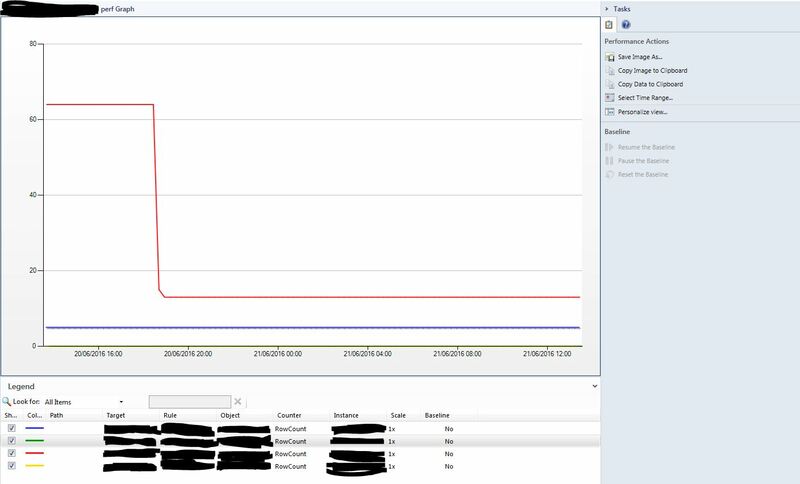 I add a performance graph and can pick out the rule (show data related to a specific object > collected by specific rules) and graph it within the SCOM Operations Console. The rule is targeted at Windows Computer, and overidden for the 4 db servers I want the results from. All 4 lines display correctly in the graph. However I cant pick out the rule in squared up, to replace the current SCOM graph. Any help would be greatly appreciated. SCOM graph attached. Hi, How is Your rule created. Are you sure data is inserted to SCOM DW? If the rule is targeted at Windows Computer it should show up on the Windows Computer object view in Squared Up on the servers where the rule is enabled by an overide. If it doesn’t show then maybe as Ehrnst is saying that the rule is not saving data to DW but only to OpsDB. The rule should contain something similar to this (as viewed in XML). The first line writes to OpsDB, the other to DW. Thanks Peter, that seems to have got it. much appreciated.